In a 1.3 million cubic-foot cleanroom at NASA’s Goddard Spaceflight Center in Greenbelt, Md., 18 gold-coated primary mirror segments await installation on NASA’s James Webb Space Telescope. Those mirrors and the telescope’s four science instruments just steps away, will become the most powerful space telescope ever built. With most of the major hardware now under one roof, assembly of the massive space-based observatory is expected to begin as soon as the telescope’s structure arrives at Goddard, with assembly expected to be completed in 2016. Once complete, Webb – with its 69.5 ft x 46.5 ft instruments-protecting sunshield deployed – will be the size of a Boeing 737 airplane. Hubble, in comparison, is about the size of a large tractor-trailer truck or bus. Webb’s 6.5-meter diameter primary mirror will also be bigger, much bigger. The telescope will have nearly seven times more light collecting area than Hubble, allowing for unprecedented infrared observations of distant objects from the dawn of the universe some 14 billion years ago. Its mirror and instruments will capture images of the universe and break down the spectra of incoming light to analyze the properties of galaxies, stars, and the atmospheres of planets beyond our Solar System. The program has not been without its own share of problems and was nearly cancelled by the United States House of Representatives’ appropriations committee on Commerce, Justice, and Science in 2011, citing ”billions of dollars over budget and plagued by poor management” as the reasoning behind killing the program. Congress, however, reversed the cancellation plans and instead capped additional funding to complete the project at $8 billion – four times more expensive than originally proposed, with a new launch date at least seven years later than originally planned. The flight-ready mirrors, built by Ball Aerospace and Technologies Corporation in Boulder, Colo., began arriving at Goddard in the fall of 2012. 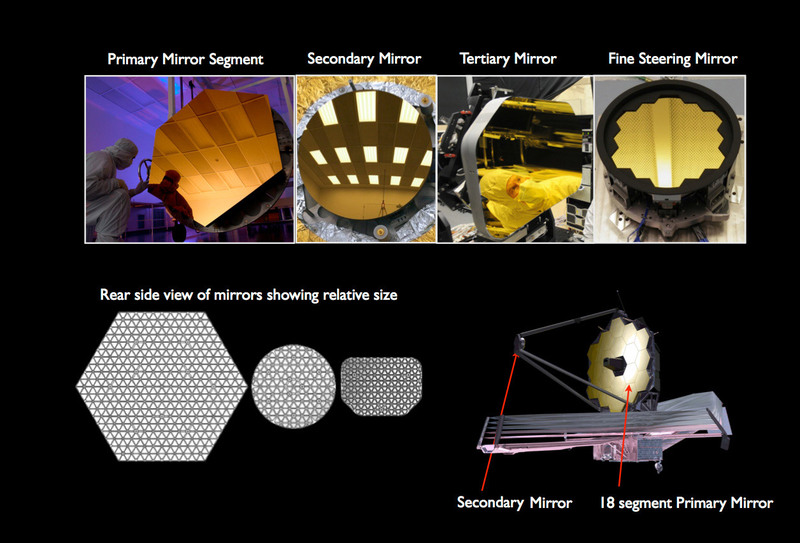 The hexagon-shape of the mirrors, with 18 mirror segments making up one giant primary mirror, was no accident either – it was an intentional design because there is no rocket in the world large enough to loft a 6.5-meter mirror into space, at least not in one piece. The 18 mirror segments can be folded up to fit into the launch vehicle and then unfold after launch, and once in space the segments will work together as a single large mirror. Another problem with “traditional” telescope mirrors is the fact that they are heavy. If Webb’s mirror was made same as the Hubble, then it simply could not be launched. To get around this problem, the team at Northrop Grumman (the company that is leading the effort to build Webb) decided to make Webb’s mirrors from Beryllium, which is a very strong lightweight metal. In order for the telescope’s instruments to function properly, the observatory also needs to be kept very cold, -400 degrees Fahrenheit cold, and Beryllium holds its shape at those cryogenic temperatures and is a good conductor of electricity and heat. – Lee FeinbergAlthough the mirrors are not installed onto the body of the telescope yet, work to install Webb’s four fragile science instruments began some time ago. The telescope’s most sophisticated and technically challenging instrument – the Mid-Infrared Instrument (MIRI) – is now integrated into a large component of the telescope known as the science instrument payload, or Integrated Science Instrument Module (ISIM). The install took four hours to complete because the delicate operation required a surgical installation for precision and accuracy – MIRI had to be positioned to a tolerance of 25 microns, or one one-thousandth of an inch – which is less than the width of a human hair. The ISIM itself acts like a chassis in a car to provide support and house all four of Webb’s science instruments – it’s the heart that enables the whole mission. 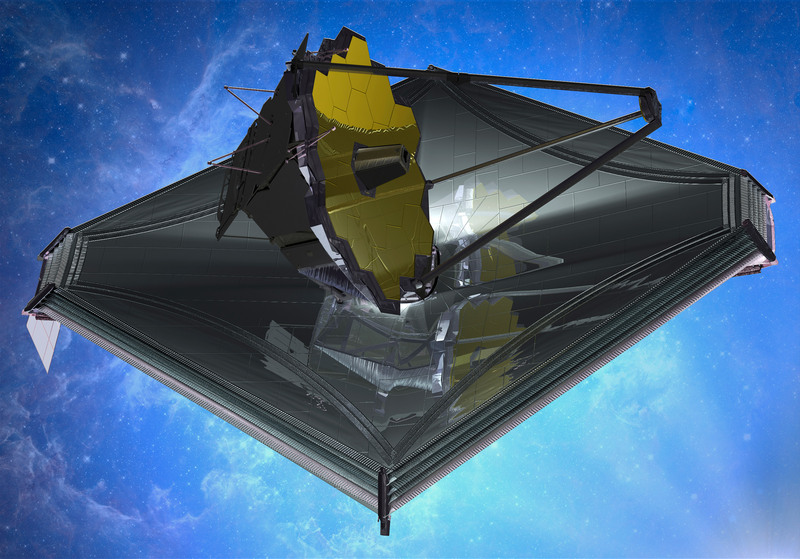 Once the JWST is in space and MIRI goes operational it will open up the cosmos to astronomers by giving them views of colder, more distant objects than has ever been seen before. MIRI’s camera and spectrograph will observe light with wavelengths in the mid-infrared range of the electromagnetic spectrum of five microns to 28 microns – longer wavelengths than a human eye can detect and even beyond the 0.6 micron to five micron wavelength range of Webb’s other three instruments. “Using this mid-infrared instrument we will be able to view the Universe at unprecedented sensitivity, which will help us to solve the mysteries of galaxy birth as well as the formation of solar systems – a key to understanding our own origins,” said Professor Martin Ward, UK Science Co-Investigator on the MIRI project from the University of Arizona Department of Physics and Astronomy. MIRI’s camera will provide wide-field, broadband imaging that will undoubtedly continue to impress humanity with incredible views of the universe same as Hubble. However, unlike Hubble’s cameras, MIRI will see objects 10 to 100 times fainter than Hubble can see, and its spectrograph will enable medium-resolution spectroscopy, providing new physical details of the distant objects it will observe. Regions of obscured star formation, molecular hydrogen emission from previously unthinkable distances, the physics of protostars, and the sizes of Kuiper Belt objects and faint comets are all fair game to the power of the MIRI instrument. Having the capability of both a spectrometer and an imager, basically being two instruments in one, gives MIRI the ability to point at an object in space to record both its image and spectrum. MIRI’s capabilities will also allow it to see light emitted by molecules that reveal a wealth of physical information and can reveal the presence of life on other planets, in addition to seeing through dust which obscures key phenomena such as star formation. Physical properties of objects across the universe, including temperature, mass, and chemical composition of those objects, will all be studied by the giant telescope thanks to MIRI, which will hopefully answer long-standing questions that Hubble and the other great observatories alone cannot answer themselves. – Professor Martin WardThe instrument will need to be cold – very cold – in order to operate correctly. MIRI will operate at a temperature of minus 270 degrees Celsius, and it will take approximately 200 days after launch to reach its optimal operating temperature. To ensure MIRI is protected from excess heat, it is housed in a thermal shield, which basically resembles foil. 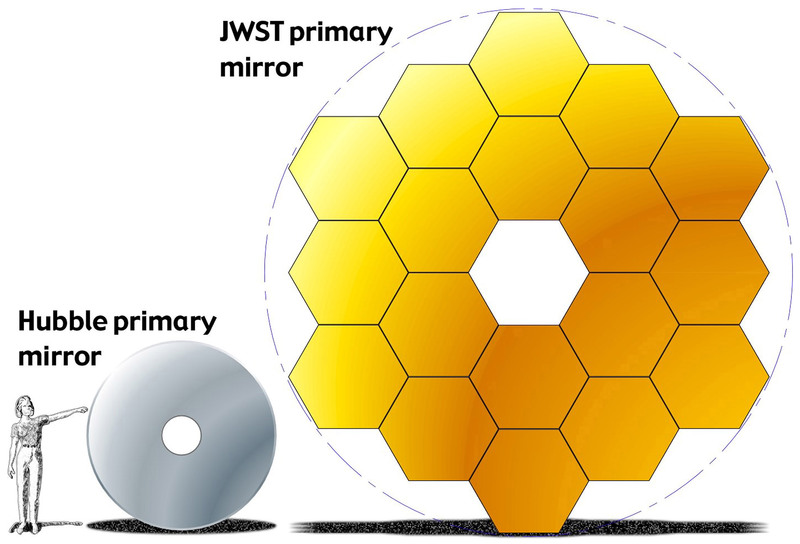 To obtain images and spectra in infrared light that is invisible to the human eye, the JWST must be cooled to a very low temperature (-383 F or -230 C) in order to avoid being blinded by their own infrared emission, and, since MIRI will operate over longer infrared wavelengths than the other three instruments, it must be made approximately 35 degrees colder than the rest of the ISIM. Webb passed its first significant mission milestone for 2014, a Spacecraft Critical Design Review (SCDR), several weeks ago. The week-long review by an independent panel of experts involved extensive discussions on all aspects of the spacecraft – details, designs, construction and testing plans, and the spacecraft’s operating procedures were all reviewed in an effort to ensure the plans to finish construction would result in a vehicle that enables the powerful telescope and science instruments to deliver their unique and invaluable views of the universe.